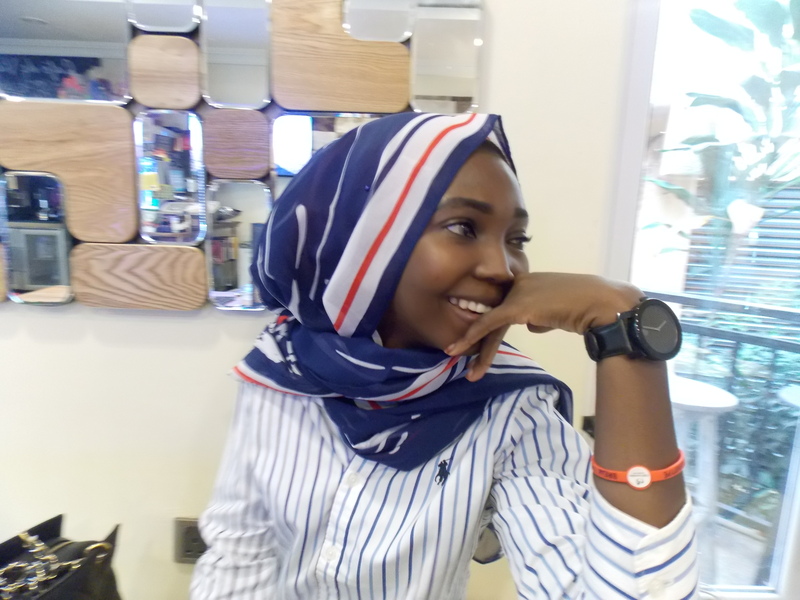 Samira Sanusi, writer and founder of a sickle cell foundation that bears her name is one of the winners of the Marine Platform Prize for writing in Northern Nigeria. Her book S is For Survivor is an account of her ordeal with sickle cell, which included a seven-year stay in a hospital and undergoing 28 surgeries. I met the woman and talked to her about her writing, her foundation and what her life is like now that she is free of the disease. In an Abuja Café, where Latin music was playing in the background, Samira Sanusi, 27, sat behind a table looking at the menu. She ordered a latte and smiled. Her head was draped in stripped head scarf in the fashion that has become her trademark. Her reputation and work have grown larger than her slight frame. Only a few weeks before, she was awarded the Marine Platform award for writing from Northern Nigeria. She was the only non-fiction writer in the list of five awardees and her debut book, S is for Survivor, is a brutally honest account of her lifelong struggles with sickle cell anemia including a seven-year stay in a hospital and undergoing some 28 surgeries. “My writing usually reflects what I am going through in my life whether it’s dealing with PTSD [post-traumatic stress disorder] from the experiences of pain or trying to find out who I am now that I no long have the disease. Trying to find out what it is I am capable of doing now because my whole life used to be just about surviving, overcoming, fighting illnesses and everything like that,” she said. In the 101 pages of the book, Samira unravels herself and tells a story that is at once touching and yet inspiring. It chronicled how she overcame the illness and now has an AA genotype thanks to a bone marrow transplant. The disease having had an impact on her physique, stunting her growth and hampering her education, it has a positive ending. But it was not an easy book to write. “It was hard writing the book because it was about me and about the things I have gone through and things I didn’t want to remember or didn’t want to face,” she said. Now she feels naked walking down the streets because she feels those who have read the book know everything about her, her pain and weakness that she was keen to hide from her family and the world. But she has no regret doing that because there was a message she wanted to share, something her father Dr. Harun Sanusi encouraged her to do. After her return from seven years of treatment in an Austrian hospital, Samira thought of putting her journal entries into a book. Her father told her if she wanted to make the desired impact, she had to be open about her struggles. “The book has been a long time in the making because I have always been a writer. I was always buried in books and then eventually I started writing as a form of diary because my dad would give us a diary every year. He writes as well, he has a few publications. I guess I got that from him,” she said. The impact of her father in her life is immeasurable. Samira hardly talks without mentioning him and one gets the same impression from reading her book. He spared no expenses in making sure she got the best treatment available and ensured she was permanently rid of the ailment. And this Samira would not forget. But what stands her apart is the recognition that she was privileged to have a father who had the resources and resolve to help her get back on her feet. But the trauma has scarred her indefinitely. “Sometimes I feel guilty for being cured of a disease that so many others are dying of. I have lost so many friends to sickle cell and I keep questioning God why he chose me to be cured while there are others who are dying,” she said. She dunked some scoops of sugar into her latte and stared into the distance. There was a glint in her eyes. She shook her head and distracted herself by stirring the latte. Eventually she smiled and confessed that she liked sweet things too much. Her blood needs all the sugar. Growing up with intermittent sickle cell crises, Samira’s greatest challenge came when she was 15. On a family road trip to their village to see her relatives, Samira was struck by another crisis. They stopped in a hospital in Zaria for reprieve but complications from that treatment made things worse. After prolonged crisis and a worsening situation, Samira was flown to Saudi Arabia for treatment. A few weeks later, doctors there wanted to amputate one of her legs. Her father refused. The doctors said she was going to die anyway and there wasn’t anything else they could do for her. That was how Samira ended up in Austria and her medical trip that was supposed to take all but a few weeks stretched to seven years. In that period, she never had the opportunity of visiting Nigeria. As if dealing with the pains of the treatment wasn’t enough, Samira was deeply hurt when some Nigerian students in Cyprus started spreading rumours about her, that she had refused to return to Nigeria because she considered the sun too hot for her. “There I was fighting for my life and people were busy spreading rumours about me, calling me ajebo,” she said, her eyes clouding over. What many people didn’t realize was that she was looking forward to returning home, to Nigeria. And when that finally happened, Samira was elated. But her prolonged stay in the hospital had not only interrupted her education, it had left her bereft of ideas on how to cope with life. For one whose formative years were dominated by surgeries and medications and doctors directions on what to do and what the next few months of her life would be like, suddenly being free of all that left her adrift. On her return to Nigeria in 2010, Samira tried to volunteer in an orphanage because of her love for children. Eventually she realized she should set up a foundation for people with sickle cell. Today her life is dedicated to the Samira Sanusi Sickle Cell Foundation. Through this foundation, she provides relief and assistance to sufferers of the condition because she realized not all of them could access the health care she had. “I never thought I would have a foundation. I never knew what an NGO was. Growing up, I always wanted to own a business empire or design cloths. I even started studying business administration at the university but when I moved back to Nigeria because I was away for seven years, I realized that my dreams and priorities shifted. There is a passion in me and what I wanted to do was to help people who are going through what I have been through. Who were going through what, if I hadn’t had a dad who fought for me, I would have been a long time ago. “There are millions of people who are out there and are having it a lot worse than I did and I wanted to make it easier for them. I had a bone marrow transplant and it was successful but it’s not everyone that can have it,” she said. At the moment, she was preparing relief materials for internally displaced persons from the Boko Haram Conflict who are also suffering from sickle cell. The harmattan was approaching and Samira knew from experience that that is the worst period for a carrier of sickle cell. And she knew just what they would need. She speaks affectionately about the people her foundation has helped and is helping. She calls them “our soldiers” because as far as she was concerned, they are gallant fighters in a tough frontline. “Sometimes they just need someone to talk to, so sometimes they call at midnight, just to talk to someone who understands what they are going through,” she said. She had to put back her plans to take a break towards the end of the year because so many of her soldiers were having crises and like a determined general, Samira throws her body, frail as it is, into the fight yet again. Even though she doesn’t get paid for her efforts, there was nothing she would rather do than that. That was why she wrote her book, she said, as a message of hope for other people. “Every day I would write about things I couldn’t tell people, couldn’t tell my dad. I didn’t have many friends then. So writing became my only escape,” she said, dunking more sugar into her latte. The book came from a place of deep pain because she had always pretended to be strong and had learnt to smile through her pains. She wanted to be strong for others but her pain was so deep she started to question herself. “I was very confused. It started with me thinking there was something wrong I did that God was punishing me for,” she said. And again it took the intervention of her father to assure her that things like that happen to people without them having done anything. After discussing her experience with a friend, he encouraged her to share her story with the world because it would inspire a lot of people. And that was how S is for Survivor was first conceived. She wrote most of the text in an Abuja café, on her phone and in a notebook. “I am probably the only writer who doesn’t own a laptop. I hand wrote all my passages except some that were written on my phone. Yeah, I’m weird like that,” she said and laughed. Even though she feels like her life is completely open to strangers who have read the book, she would do it again. In fact she is doing it again as she has started thinking of writing another book, one that would carry further the message of her first book. Writing was not only a way to remind herself of the things she had achieved and how far she had come, it was also a way of opening herself to be understood by people who never saw beyond her pain. “I don’t regret doing this. For the longest time I felt misunderstood because people didn’t understand why I did certain things,” she said. Today, Samira goes round schools and gives public talks on her ordeal and being a messenger of hope and her story resonates with people going through all sorts of challenges in life. She wants to inspire people and give them hope. Interview over, Samira walks to her car parked outside the cafe with the help of a walking stick, thankful that her father had refused to let the doctors amputate her leg. Her car is big, like her wristwatch, which covers her entire wrist. “Maybe it’s because I am small but I like big things,” she smiled. Don’t you need a big car to carry a big heart like that? Truly inspiring. How do we get these books? Hello Safiyayero. ‘S is for Survivor’ is availbale at Salamander afe, Wuse II. All proceeds from the book sale goes to the Samira Sanusi Sickle Cell Foundation.